How good is phpMyAdmin translation to your language? phpMyAdmin 3.4 is about to be released in something like two months (we want next beta to ship with brand new theme) and there is still plenty of translations to do. Published on Jan. 13, 2011, 10:46 p.m. If you like phpMyAdmin and have web design skills, this is a chance for you. The question for new default theme has been opened for a while and in last weeks we've finally decided to rather make open contest than to stick with choosing from existing themes. All you need to do is to submit theme (compatible with phpMyAdmin 3.4) till 13th February 2011. You can find more details on our wiki. Published on Jan. 10, 2011, 5 p.m. The book Mastering phpMyAdmin 3.3.x for Effective MySQL Management is already available for some time, but I still think I should promote a little bit in my blog so here it is :-). The book covers all you might want to know about using phpMyAdmin. It really does not make sense to copy text from book description, so feel free to find yourself what all it does cover. As every time, this book is written by Marc Delisle, who is for several years project admin, so probably the person who knows most about hidden features. Usually technical review of the book is done by some other developers and this time it was me doing this job (among other reviewers). I hope we did good job and you will like this book. PS: As a nice bonus, the phpMyAdmin project receives money from every purchased book. Published on Jan. 3, 2011, 11:34 a.m. It's new year (for almost 18 hours here) and it's time to balance a bit what has happened in year 2010. I'm not going to expose details from my personal life and anything related to work, so all what remains are open source projects where I am active. For phpMyAdmin it was year of quite big changes, most of them beeing agreed on Fosdem 2010. We have migrated to git from svn, what was great step forward and I really like the change. It was also decided to use gettext (or rather php-gettext) for translations in upcoming release. I can see this move (together with online translation service) has definitely attracted more contributors (hey, but there are still many languages not translated, you're welcome!). Also we've participated in Google Summer of Code 2010, what lead to several big projects being merged into our code base (see my summary for more details). All in all, we're heading to 3.4 release in first months of 2011, which will be quite major step and hopefully heading in right direction. In Gammu and Wammu, there were lot of code improvements, most of them probably going into Gammu SMS Daemon (the latest one being unified SQL backend removing lot of code duplication). Another major improvement is The Gammu Manual covering everything from Gammu command line, through SMSD up to python and C API. On the other side I've bought me a Symbian based phone, which does not work with Gammu and I use Series60-Remote for that, so my interest in Gammu has declined a bit. Even though I've started adopting some packages in Debian, so it looked like I will end up with much more than last year, but at the end I've decided I'm too overloaded with some of them (and don't use them anymore), so I've given some for adoption and got rid of nanoblogger (and nanoblogger-extra) and looking for somebody to pick up gpointing-device-settings. Maybe all mpd related packages will follow soon, because I currently do not use mpd, so it limits quite a bit my ability to test them. And of course: Happy New Year 2011! Published on Jan. 1, 2011, 5:25 p.m.
phpMyAdmin 3.4 is just in the alpha state (second alpha release being done right now), so it's time to continue in presenting new features. As usual, just download 3.4 alpha or try them on our demo server. If you find any problems while playing with it, do not hesitate and ask or report bug. This feature was implemented by Ninad Pundalik during Google Summer of Code 2010. Published on Nov. 30, 2010, 2:03 p.m.
As phpMyAdmin is heading closer to 3.4 release, we would like to invite translators to be able to bring this version localized as much as possible. We don't expect any message changes to happen in 3.4 anymore, so it's best time to start translating right now. You can find more information about translating on our website, but you can as well start translating right now at translation server. There are so many languages, but majority of languages are really in bad shape right now. This is your chance to contribute to the free software! 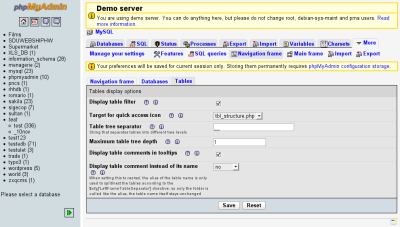 Published on Nov. 26, 2010, 12:20 p.m.
Next article highlighting some new features which will come in phpMyAdmin 3.4 is about more little changes. You can try them it out on our demo server. Or just wait few hours for first alpha release of 3.4. This feature was implemented by Lori Lee during Google Summer of Code 2010. 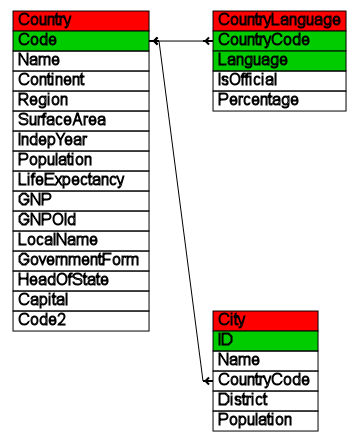 Published on Nov. 23, 2010, 11:46 a.m.
Next article highlighting some new features which will come in phpMyAdmin 3.4 is about relations export. This feature is not much known anyway, so if you have not seen it in phpMyAdmin, just try it out on our demo server or configure phpMyAdmin configuration storage in your copy. This feature was implemented by Muhammad Adnan during Google Summer of Code 2010. Published on Nov. 19, 2010, 2:05 p.m. The upcoming 3.4 release will bring lot of new functionality. Some of that has been developed by core members, but many contributions were made thanks to Google Summer of Code program, where five students were working on improving phpMyAdmin. 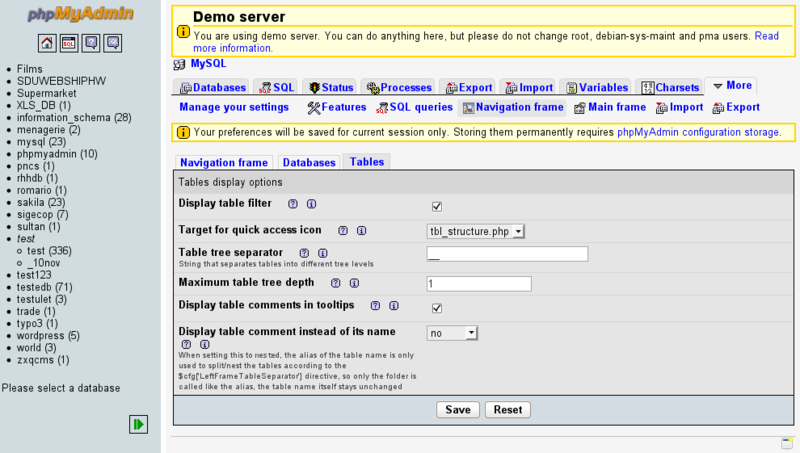 If you want to try new features, you can do that on the phpMyAdmin demo server. And I will introduce them in series of blog posts. This feature was implemented by Piotr Przybylski during Google Summer of Code 2010. Published on Nov. 18, 2010, 9:19 p.m.
With increasing popularity of Flattr (114,057 € has gone through the Flattr system in two months), several people start to recommend what things to flattr. I'm not going into this business, however they seem so find interesting things for me so you might like it as well. The Flattr Free and Open Source Software by Raphaël Hertzog is actually thing which has attracted me to the Flattr. It collects recommendations how to tag your free software on Flattr and each month it publishes five recommendations which projects to flattr. The other thing I've noticed is list made each month by Evgeni Golov, which I've mostly noticed because increasing popularity of phpMyAdmin on Flattr, because he was really fast in advertising it :-). Published on Nov. 4, 2010, 9:21 a.m.